Primary school children from West Sussex and Hampshire are set to experience life as a smuggler for the night after winning an annual competition run by The Novium Museum in Chichester. Daring double escape, coded messages and smuggling a giraffe out of a circus are some of the ingenious and creative stories submitted for this year's writing competition. 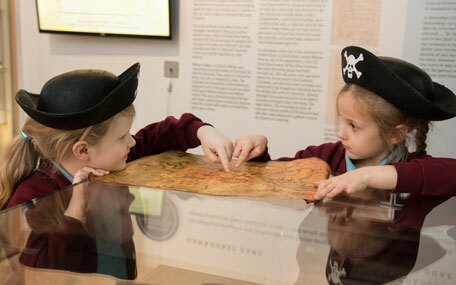 Budding authors, aged between 7 and 11 years old, were prompted to take inspiration from The Novium Museum's new exhibition, Cutlasses & Contraband asking the question: "If you could be a Smuggler and take part in an adventure, what would you do?" Five top prizes of a sleepover at the museum for each winner's class were on offer, thanks to funding from the Heritage Lottery Fund's Sharing Heritage grant. Esteemed writer and creative writing expert, Greg Mosse, and his wife, multi-million-selling novelist Kate Mosse, kindly agreed to judge this year's entries. Greg said: "Kate and I were very honoured to be asked to judge the creative writing competition," The stories all capture the thrilling nature of the life and death struggles of the 18th century." Sophie Sappleton and Charlotte Vickers from Hampshire, and Millie Boulter, Lottie Hodges and Leo Malan from West Sussex were selected as overall winners. "The standard of writing was exceptionally high," says Councillor Eileen Lintill, Cabinet Member for Community Services at Chichester District Council. "We received more than 300 entries this year, and it's wonderful to see how many talented young children were inspired to write. We would like to thank Greg and Kate for taking the time and using their expertise to judge the entries." Sophie Sappleton of Oakley C of E Junior School, Hampshire: "In her story 'The Betrayer', Sophie tells a tale of daring double escape. She uses many exciting stylistic effects, such as the onomatopoeia of 'snap', a metaphor of being rooted to the spot and a simile of being hunted by customs officers 'like a pack of tigers'. Charlotte Vickers, of North Waltham Primary School, Hampshire: "Used inventive stylistic devices in her piece, 'My Sensational Smuggling Story'. In addition, she devised a coded message (in which letters of the alphabet are replaced by numbers) - and she incorporated this message cleverly into her story. Lottie Hodges, of Broadwater CE Primary school, Worthing: In her story 'A Smuggler's Sweetheart Journey' Lottie uses extremely vivid vocabulary with lots of well chosen adjectives, sharp dialogue and rapid story progression. Like a story written in the 18th century, each small chapter has an evocative title. Leo Malan of West Dean Primary School, Chichester: "Finally, we thought that the story entitled 'The Hawkhurst Betrayal: Eye of Nefertiti' was very clever. The whole thing takes place in the mind of a jewel smuggler, standing on the beach at night with the noise of the sea and the shingle. It is a very evocative internal story." Cutlasses & Contraband; A Smuggler's Tale at The Novium Museum is open now and showcases the untold stories of local smugglers and their victims in the Chichester District. The exhibition, which is free to visit, features an illuminating set of objects from the museum's own collections such as a cutlass, a smugglers talisman and copper printing plates which tell the story of the Hawkhurst Gang's raid on Poole Customs House. Chichester Community Theatre is producing Greg's play entitled 'The Hawkhurst Gang' in Priory Park and at the Weald & Downland Living Museum, this summer. The Novium Museum is also hosting Smuggling Saturdays every Saturday until 10 March 2018. Funded by the Heritage Lottery Fund, families can take part in the free activities which include interactive storytelling, craft and handling objects between 11am and 3pm.